These Pumpkin Beer Chicken Tacos are going to blow you away. Slow cooker chicken simmered for hours in pumpkin beer and pumpkin puree…this is taco heaven. If you’ve never had a pumpkin beer before, I really suggest you try one. I tried my first pumpkin beer at the Rogers Park Brew at the Zoo in Rhode Island last month and I couldn’t believe how good it was. So when I got home you know I had to go and get myself a few packs of this pumpkin ale, the brand I picked up was Saranac, and it’s amazing. 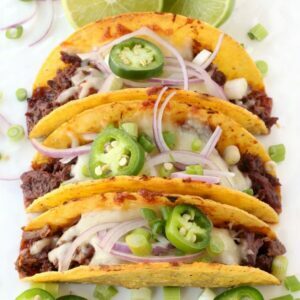 Then I signed up to do Taco Week over at Food Fanatic. I was asked to come up with a boozy version of a taco. Me, come up with a booze filled food? I can definitely do that. And I did – slow cooked shredded chicken in pumpkin beer. Taco night is always a favorite in my house – I’m sure in most people’s houses it is – you can customize your taco with all the toppings you want, make it spicy or less spicy…it’s a meal that suits everyone. These Pumpkin Beer Chicken Tacos are a little different than your average ground beef taco, but I promise it’s going to be a family favorite too! The shredded chicken filling cooks up in your slow cooker which is perfect for a busy week night or for a party when you don’t want to be sitting and cooking while your guests are there. The chicken gets simmered for hours in pumpkin beer, pumpkin puree and seasonings until it falls apart and gets loaded up in your taco shell. 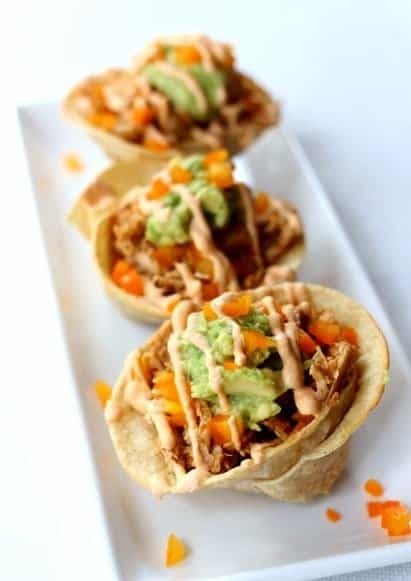 I made my own “taco cups” from flour tortillas put in a muffin pan but you don’t have to make them yourself – any taco shell will do. What you do have to do is make the pumpkin sriracha sauce that goes on top. It’s so good even the boys were asking for the “special sauce” drizzled on top of their tacos. You might even want to double the sauce because it’s pretty good on just about anything. Get in the Fall spirit and try these Pumpkin Tacos on your next Taco night – and don’t forget plenty of extra pumpkin beer for drinking! Make sure to click over and check out the full post and recipe over at Food Fanatic, and don’t forget to check out some of the other tacos recipes too! I just heard about pumpkin beer and couple days ago and have been wanting to try it. Your recipe gives me reason to go out and buy some so I can make this dish as it just sounds delicious! Pinned! Thanks Julie! 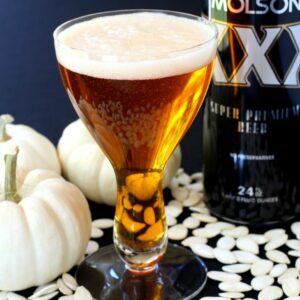 Pumpkin beer was new to me to- I hope you try them! I haven’t seem pumpkin flavoured beer before here in Australia. Thanks for drawing my attention to the product, definitely need to keep my eyes peeled for it. 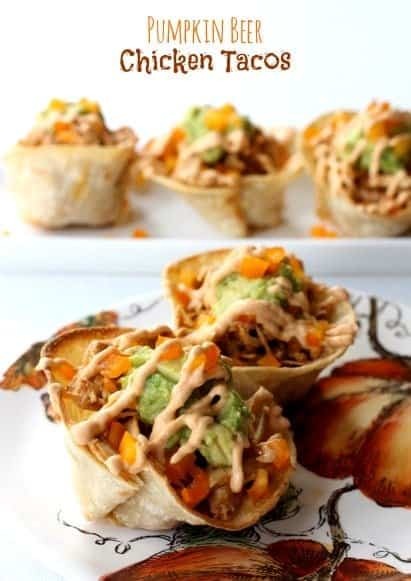 These little tacos look and sound so delicious too! Thanks Thalia- and if you can’t find the pumpkin beer you could definitely use regular ale along with the pumpkin puree and they would be awesome too! 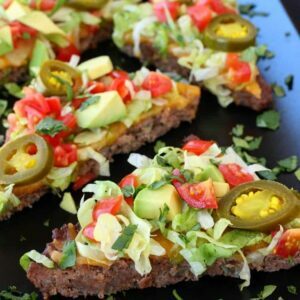 These are my favorite twist on a taco recipe! Love the addition of the pumpkin beer! Thanks Tricia- the crock pot makes it easy! Basically perfect fall food right here! That Pumpkin Sriracha…omg dying! A year ago I would have never eaten sriracha- now it’s my favorite ingredient to use in a sauce-Its so good! Sure Meghan, as long as there is a link back to the post that would be great! I’ve been to the site so it’s really fun to be included. Thanks again! Any excuse to add booze to food, count me in too!! And you scored extra points for pumpkin. LOVE everything about these tacos!! What about doubling this recipe? Or corn to the recipe? might be nice for a little color and sweetness. Alice, you could definitely add corn to this recipe! It’s really easy to double this – grab 12 more corn tortillas and double the filling amounts in the recipe (same cooking time) and you’ll be good to go!